Preservation of Community Assets: Follow Up To "Shedding Light On Hidden History"
Today yours truly has a follow up to a story that Blogger posted last week on the Washington Street Historical Society's effort to gain recognition for the Little Syria community, "Shedding Light On Hidden History" (01/27/16). Blogger sent an email to Todd Fine, the director of Project Khalid and president of the Washington Street Historical Society. (http://www.savewashingtonstreet.org) Mr. Fine is spearheading the campaign to preserve the community's history. In his reply, Mr. Fine expressed his frustration over the National September 11 Memorial and Museum's attempts to exclude any mention of Little Syria and mentioned efforts to install a public art piece, dedicated to Little Syria. Mr. Fine also sent a link to an article, published in the New York Times a little over two years ago. The article, "As Plaza Is Named for Champion of Downtown, Talk of a New Park," by David W. Dunlap. 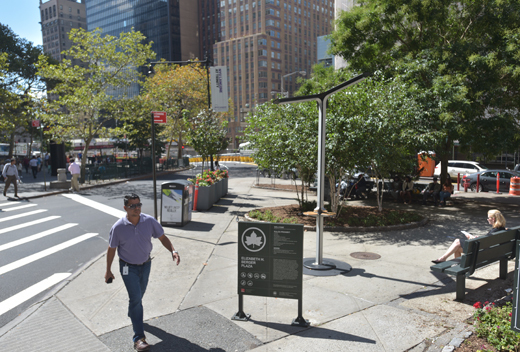 The article looks at how the Hugh L. Carey Brooklyn-Battery became a green space, something long advocated by the Downtown Alliance. it also discusses the ongoing initiative of the Washington Street Historical Society to gain recognition for this immigrant community. 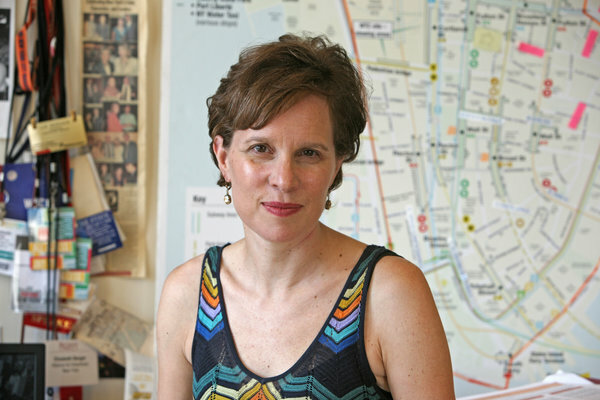 The late Elizabeth H. Berger, who passed away in Autumn 2013, was the president of the Downtown Alliance (http://www.downtownny.com) and champion of her Lower Manhattan community. At a ceremony in December 2013, the Hugh L. Carey Tunnel was renamed in her honor. At the ceremony, William T. Castro, the commissioner of Manhattan parks, looked to the future in which there would be not two plazas but one big one. His listeners understood what Mr. Castro meant. Mr. Dunlap writes, "The parks department is taking very seriously an idea-long advocated by Ms. Berger and the Downtown Alliance-to fuse the Edgar and Trinity Place traffic islands into a single park by rerouting a tunnel exit lane that divides them. 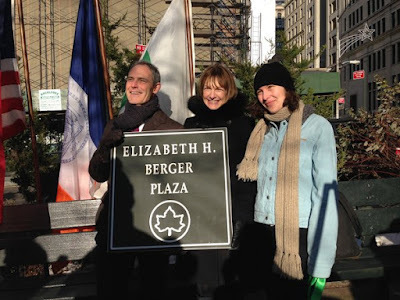 (It is the triangular Edgar Street island that is now formally known as Elizabeth Berger Plaza.)" You could have Lower Manhattan's biggest open space north of Bowling Green and south of the 9/11 Memorial...necklace of green space, upward from the Battery. 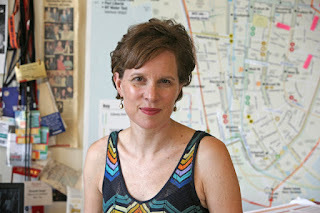 In 2009, Ms. Berger and other supporters proposed "...rerouting the tunnel exit joining the two small islands-currently maintained as landscaped open spaces under the parks department's Greenstreets program-to create a more engaging, usable and parklike open space with square." The renaming ceremony were encouraged when Mr. Castro publicly acknowledged George P. Vellnakis, the landscape architect with the parks agency, for drawing up the preliminary plans for the new park Mr. Dunlap noted, "The agency has $2.5 million to cover the project." looking into a traffic analysis that will study the effects of rerouting traffic around the new proposed space. Further, Mr. Bernstein could not speculate, at the time, of how the incoming administration of Mayor-elect Bill de Blasio would address the proposal. Regardless, Lower Manhattan was on the radar of then-chairperson of Mr. de Blasio's transition team, Carl Weisbod, former prudent of the Downtown Alliance. Anthony e. Shorris, then-designated first deputy mayor, served as consultant for the alliance in 2003. 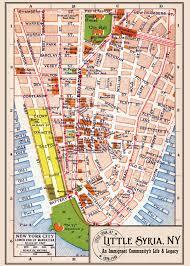 The Downtown Alliance manages the Downtown-Lower Manhattan Business Improvement District. In 2009, the BID issued a report, "Five Principles for Greenwich South," which focused on "...a trapezium-shaped area on the west side that includes much of what was once an Arab-American neighborhood called Little Syria." The story of Little Syria, its residents and many of its small business is sadly like that of other immigrant communities in the United States. The residents and business were displaced and scattered by the construction of the Brooklyn-Battery Tunnel in the post-World War II period. According to the alliance, the tunnel brought the noise and pollution of cars to the community. It created a network of traffic island, one of which is bounded by Edgar Street, allegedly the shortest in New York City. The island stretches about 100 feet, from Trinity Place in Greenwich Village. The alliance has proposed a more welcoming, engaging pedestrian environment for the area. "Little Syria, NY An Immigrant's Community Life & Legacy"
In 2013, the Washington Street Historical Society sponsored the repair and repainting of park bench in the Edgar Street Greenstreet, damaged in the wake of Hurricane Sandy. Plaques were attached to the benches, commemorating historical Syrian- and Lebanese-American figures . One plaque quotes poet and writer Khalil Gibran. Those are the sons of my homeland, who are born in cottages, and die in palaces. The plaques and a sign identifying community history was unveiled in October 2013. Todd Fine, the president of the WSHS enthused that the event ...brought together a beautiful rainbow of people who embody what made the Washington Street neighborhood so great. However, Mr. Fine said he was quite insulted that Little Syria's advocates were not invited to the plaza renaming ceremony, nor consulted on the renaming of the Edgar Street Greenstreet. Mr. Fine told Mr. Dunlap, We have put into that park. At the ceremony, Ms. Berger's husband Frederick Kaufman gushed, I couldn't imagine a more fitting tribute to Elizabeth H. Berger than Elizabeth H. Berger Plaza. Fitting indeed. Perhaps what would be more fitting is a public art installation commemorating Little Syria. Blogger understands and accepts that current events and politics dictate that anything that puts the Middle East in a positive light be disregarded, shunted aside, in favor of more negative narrative. However, Blogger asks you to set aside your assumptions and consider this American community as positive for Lower Manhattan. 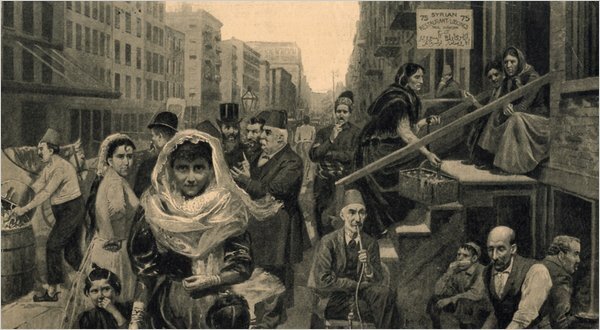 The people who lived and thrived in Little Syria came here, built homes and businesses. They sent children to school, established institutions, worked hard, and made something of themselves. Their story is no different than any other immigrant community throughout the United States and the rest of the world. Little Syria deserves its place in the sun.